Delta Deas Rowing Club will be hosting the fifth event in the Friday Night Challenge Series. Delta Deas’ course will feature a 1000m sprint on the Deas Slough. If you’re having post-Cascadia withdrawals, this is the perfect opportunity to race on the Cascadia regatta course a month later. 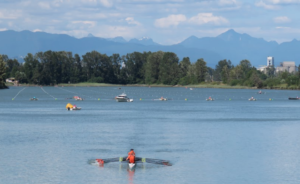 Known for its consistently flat waters, Delta Deas is also one of BC’s Para Rowing Centres of Excellence. Racing will be 250m duelling style, with all participants guaranteed at least two races. Participants should arrive at 5:30pm for a pre-race meeting at 5:45pm. Races will begin shortly after 6pm, starting with the Women’s 1x, then Men’s 1x and then the Mixed 2x. Participants may race in the 1x and 2x categories. Racing is anticipated to be finished by 8:15pm with a BBQ at the Delta Deas Boathouse to follow. If any participant is unable to bring their own boat, please contact Liam Anderson at liam.anderson@deltadeas.com to arrange a boat rental. Registration is available here. All participants must be active members of Rowing BC and Rowing Canada Aviron. Even if Deas Island is not in your neighbourhood, we encourage you to attend! From Nanaimo, take the 12:45pm ferry from Duke Point to Tsawwassen. From Victoria, take the 3:00pm ferry from Swartz Bay to Tsawwassen. Delta Deas is approximately 25-minutes from Tsawwassen. The address for the Delta Deas Rowing Club is 6090 Deas Island Rd. While you’re at the Delta Deas Boathouse, walk or bike to check out the rest of Deas Island. Visit nearby Westham Island, home of the Westham Island Herb Farm, Wellbrook Winery and U-Pick Farm, and the Alaksen National Wildlife Area.